Sometimes weaving drives me crazy. I’m not talking about the many times threads have ended up in a tangled mess. Nor how hard it is to make changes once the threads are under tension on the loom. Nor the lack of portability. No, I’m talking about the times an idea pops in my head and I don’t want to wait until one of my looms is free to try out this idea. Nor do I want to invest hours calculating threads and sequences, then setting up the loom before I get to see the cloth. Usually the slow, repetitive nature suits me, but sometimes I want spontaneity and faster gratification. I want whatever the weaving equivalent is of a quick sketch. 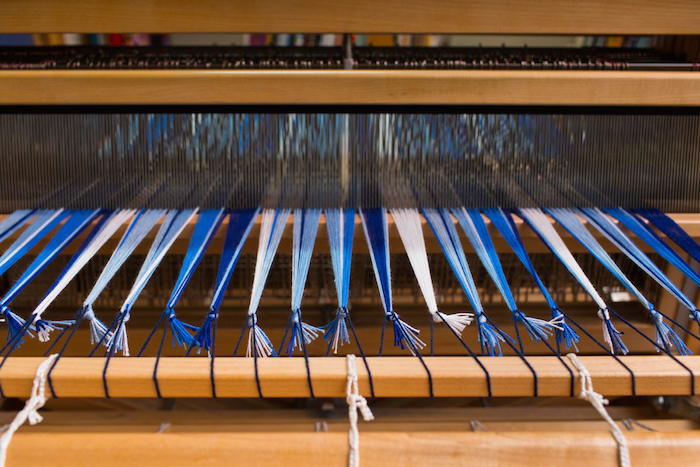 Today as I look at all the threads on my loom, I wonder: What if the realities and constraints of weaving are a gift? A gift that is teaching me to trust myself to make decisions? If weaving were more like sketching, it’s possible I wouldn’t make a decision. I’d create sample after sample after sample, tweaking this and that and feeling uncertain. There have been many “what the hell was I thinking” moments. I always have the option to cut a project off the loom. But the fact that I’ve invested a lot of time in the project keeps me at the loom, determined to figure out a way to weave 11.75 yards of thread into beautiful cloth. Warp by warp, trust in my decisions grows. I have learned to hold each piece I weave lightly even as I invest a lot of time, creativity, meaning and love into each one. 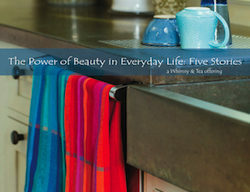 They are both “only” kitchen towels, napkins and table runners and so much more for me and for the people who buy them. The making of the cloth matters. The designing, weaving, hemming nourish me. I am fed by the rhythms of the loom, the time with thread and color, so when the towel is finished, I’m ready to let it go and bring beauty and joy to someone else. I am grateful for the structures of weaving that encourage me to make decisions and commit to them while also holding them lightly. I want to bring these qualities to other areas of my life and see what other gifts unfold. Thanks Marilyn! You are always such an inspiration! It is always a quiet thrill to see your words here. Thank YOU, Jena, for all your support of my words. This is such an eloquent description of the creative process, Marilyn. There is nearly always a tension for me between what I envision creating and the reality of what is created. Sometimes the difference is fortuitous: I end up with something different that I love. Sometimes I quietly mourn the result. My marker suddenly lets loose a blot of ink and a pristine image is ruined. There is something delightful and fun about that unknown result. And as you wrote, it is usually wondrous to watch as my creation slowly emerges as I apply ink. It’s reassuring to know this tension and suspense is experienced by other artists. I’m glad what I wrote resonates with your experience of the creative process, Judy. It is fun to watch a creation unfold, even if, as you say, you end up quietly mourning the results. I have been trying to take that approach, to see the offering in whatever is frustrating me at the moment. Thanks for your insights. Always an inspiration! Is it yielding insights, Barb? Or at least less frustration? I’d love to hear your experience.